We've been in a dome of unseasonably mild air for the past week. That's allowed me to do a bit of yard work. Viola. A new channel of "Cat TV". I've had this pole feeder for awhile. Originally, it was going to hang on a hook off the northwest corner of the deck. Birds like to use feeders where there is some cover so, in the event of a predator arriving, they can flee to the relative safety of a nearby bush or tree. 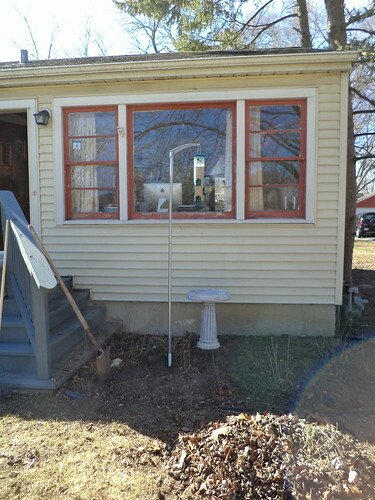 The back has that, but I wanted to see the birds and even when I get the electrical fixed and move my office back into the original room, there's no place for me to put the feeder, except on a pole, in the back yard. Because the fixing of the electrical issue is months away, I'm here at the picture window when I'm on the computer. I needed to put the feeder where not only the cats, but me could see it. I raked the bed clear. The warm weather has the bulbs pushing through the ground and the frost is out of the ground now. That pile in front is debris from last years weeds, and pine cones off the pine trees to the right. It's not time for yard waste to be hauled away so this is going to sit for a bit. I should get one of the yard waste cans and, at the next slightly warm weekend, move this into that can so it doesn't kill the emerging grass. The birdbath is what I won last year in a contest from my favorite nursery. It's heavy duty amalgam; kind of concrete-ish, but much less heavy. It's also cracked. It was in the backyard, by the air conditioner. But the wind over the late fall and winter knocked it over a couple of times. Where the pedestal meets the bath is cracked. There is a hole on the left side and one in the bath itself. When I filled the bath with water, it all drained out. A friend has suggested an epoxy which comes in a quart container and can be brushed on. It provides a seal and should prevent water from leaking. That was disappointing, but it's nice to think I can fix it, once the weather stays above 60 at night. It takes several days for new feed and new feeders to be noticed. I filled the bird feeder stuck to the north window. You can see "Police cat" is on duty. Hamlet paws at the window and the squirrel usually runs. I think this is the little guy who had a scabbed over wound on his shoulder. He was fat so he's getting food, but his left shoulder had a scab an inch long, as if something had tried to grab him or he cut himself going somewhere. The fur had fallen off around the scab. He didn't look worse for the wear other than this injury. He was jumping from the pine onto the window sill and then climbing the window to the feeder and crawling in. This morning, when I left for work, a squirrel was in the feeder. I have a critter block on the stump in the back yard, but I think the wide variety of seed in this feeder is more attractive than the corn and sunflowers in the block. Hamlet was right at the window, too. And I heard a familiar bird song out the front window as I gathered my belongings. He's hard to see, but there is a chickadee on the left side of the feeder. I noticed there was another in the tree that's off the frame to the left. Chickadees tend to be first to find new feeding potential. I expect, if they have found this, the sparrows and finches won't be far behind. I know the squirrels will try to claim the feeder. I don't have a baffle on this. I'm debating greasing the pole come spring. I should have put cayenne pepper in the seed when I filled it. Birds can't taste that, but squirrels can. It takes, I'm told, a couple of mouthfuls of cayenne-laced seed and they learn this is not something they want to eat. I found a smaller, better designed tray feeder which adheres to a window. I'm going to give that a try. 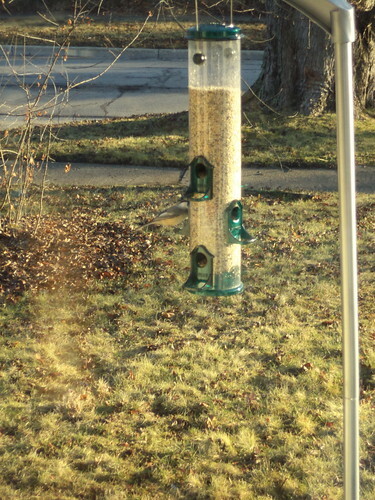 I gave away the other feeder since it just didn't seem to want to stay stuck to the front window, irrespective of a 1 pound squirrel sitting in it. They notice the squirrels when they get into the window feeder. They had not noticed the chickadees on the pole because this is the first day I've had them. 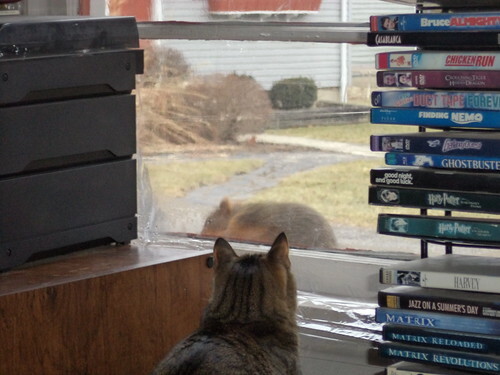 I remember, years ago, when we did this, there was a cardinal pair who, once they learned the cat and us, couldn't get to them through the glass, came to the feeder and let us watch them. I'm hoping that will, eventually, be the case. It's about making your space inviting for you, and giving the cats something to watch while you're gone during the day. I have a feeder hanging from a tree branch next to a rhododendron.